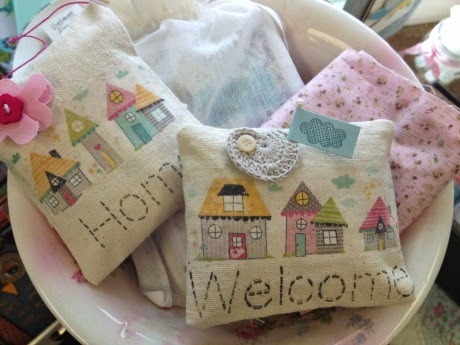 Linnie Blooms Design Team Blog: More New Products! Well, hello there! I hope you had a restful weekend. Here, the weather was amazing and I couldn't have asked for a better weekend. Today, I have yet another new product to share with you. Even though my week of new product reveals is over, I realized that I haven't really shown you everything yet! So today I'm excited to show you the Mini Pillow Cover. These two were designed by Therese Hennessy using Bella Blvd. paper, Linnie Blooms Mixed Stitched Greetings Stamp Set and the image transfer process. Aren't these adorable?! I can so see using these as sachets filled with potpourri, door hangers, or Christmas ornaments. So much fun! I hope you will give them a try!